News spread like wildfire of the first successful sun garden. The sun was Hegula, hearth of a destitute system. Normally, I don’t waste my time on mining colonies. There are plenty of systems with two, three, or more populated planets. Those systems can supply me with crowds for months. Mining systems are a different matter. I’ve been to systems where the miners close the mines, gather up their families, and take the day off to see a good show. That’s it. They have a great time, believe me. They enjoy my starwhals more than anyone in a cosmopolitan system. From my perspective, though, it’s hardly worth weeks in the dead space between stars. For Hegula, I made an exception. Everyone I talked to ached to see a sun garden. The mere concept had been futura mythos since anyone could remember. Now, it was actual arable farmland. I wanted to see it. And my line of work allows me to travel. Of course, I took the practical route: the starwhals and I edged towards Hegula with stops at all the most affluent systems on the way. It wouldn’t do to fly straight. I’d save little time and miss many opportunities. I reached Hegula’s nearest populated neighbor, more than two years after beginning my slow journey. I hadn’t thought much of the sun garden during the interim. It was merely the guiding light I navigated by. Nonetheless, I began to grow excited. In weeks, I’d be there. I radioed ahead, and it was such a small system my message was patched straight through to the mayor. I left for the final flight (a short two week hop) with assurance that the citizens of the Hegula Hephaesta Mining Colony looked forward to my presence. I was also invited to tour the garden. For the starwhals, arrival in the Hegula system was like our arrival anywhere else. They coasted alongside my ship through the cold of space. When we reached Hegula’s asteroid belt, I released a cloud of astral microbial dust. The starwhals fed, filtering the microbes like whales filter plankton through their baleen. I put on my jet-pack space suit and zipped among the asteroids, setting up the field transmitters. Once switched on, the transmitters broadcast an electric field strong enough to keep the starwhals contained. It’s like a giant playpen: enough space for the starwhals to soar about and a few asteroids enclosed with them to keep the landscape interesting. It’s purely a precaution. The starwhals are gentle beasts. They’re well trained, and they’ve never shown the slightest interest in leaving. What would they eat in the empty space of a star system? Outside of their native nebulae, they need me to feed them. Next I set up the tent where the audience would watch. I picked a medium asteroid (more the size of a mansion than a moon) and lashed my clear flexi-glass circus tent to it. I turned the algae pumps on and sealed them inside. The tent would inflate in plenty of time for the show. Then I noticed another space-suited figure watching me. My in-suit radio found the right channel, and I had my first conversation with Hegula Hephaesta’s mayor. I looked at the three black blubbered behemoths. They’d keep. I accepted Blanchley’s offer. He escorted me onto his own small ship. I left mine parked on an asteroid inside the starwhals’ enclosure. His ship was smaller than mine — designed for in-system flight, rather than star-hopping. I have to admit, the colony surprised me. Though backwater, it had a rustic charm. No sparkling spheres of ocean and mountain; no sprawling centers of culture, science, and art; just rugged rock, carved into good homes where good people can live. In all, the colony spread over a hundred some asteroids. The largest few cradled entire cities, covering the surface and burrowing beneath. Smaller asteroids sported state parks, nurtured at great cost under atmospheric domes. The very smallest asteroids were private homes, belonging to Hegula Hephaesta’s wealthiest citizens. All the asteroids were clustered close enough for easy travel among them. A small, well-knit community… yet large enough to keep me and the starwhals busy giving shows for a few weeks. My tour ended with a look at one of the larger mining asteroids, a giant rock laced with valuable metal and minerals. This particular mine, Blanchley told me, was representative of the others. Most of it had been eaten away, leaving a half-moon husk of the original rock. Valueless crumbs floated around the husk, remainders of the half that waned. Blanchley and his colonists feared the day when all the valuable minerals were mined and shipped away. What would their colony feed on then? Only, with the new sun garden, they had new hope. By show time the next morning, my circus tent filled with eager spectators. Blanchley moved among them in all his mayoral splendor speaking words of mayorly wisdom. His voice rose above the others, but the volume of every voice was climbing. I waited in my space suit, among the starwhals, all of us hidden from sight in the shadow of an asteroid. The clamor of the crowd filled my ears, channeled through my suit’s radio. At the magic moment, when expectation peaks and threatens to fall into impatience, I started the show. Speakers pumped music into the tent and my starwhals pumped waste gases out of the tube organs under their fins. The two older, larger starwhals jetted away from me to my left and right. They accelerated to an incredible speed and whizzed around the tent asteroid. Hermes, a mere calf compared to the others, jetted straight towards the flexi-glass dome. I loved the gasps as Hermes and I, my legs wrapped tight around the knobbed end of his tailfin, stopped, suddenly, within inches of the flexi-glass. Until the last moment, the crowd had been too busy watching Jojee and Trina circling to notice our head-on approach. During a final, blaring fanfare, I dismounted Hermes and used my suit’s jets to maneuver along the length of his body, bringing me closer to the tent. Jojee and Trina joined formation behind me, and eager faces watched our every move from behind the flexi-glass. Jojee, Trina, and Hermes took turns spinning axially as I said their names. After that, I walked the crowd through the usual spiel. Hermes jetted about as I pointed to and described the different parts of his anatomy. 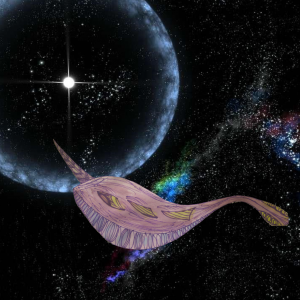 The children love learning about the starwhals: how they use their tube organs to jet through space; how they pick up radio waves, to communicate, with their narwhal-like horns; and how I found them in the Kleidadoan nebula. Then the real stars of the show take over. Hermes does flips and somersaults. Jojee and Trina propel small asteroids about with blasts from their tube organs. The effect is halfway between an airshow and an aquarium exhibit. I wonder if the starwhals would seem so whale-like if it weren’t for their name… Their bulbous forms do give off more of the impression of elephant seals. However, their intelligence combined with their eagerness to do tricks, win treats, and please people always brings back the idea of whales to me. I miss them. The show went well, and Blanchley met with me afterward. We arranged a time for my tour of the sun gardens, and he informed me of the local news. The Expansionist government was threatening to institute martial law on Hegula if the system didn’t pay its taxes. I wasn’t worried. If there was trouble, it would take weeks or months to come. I’d be safely away by then. Even so, the Expansionists are reasonable. Or so I thought. Blanchley took me to the sun garden on his little ship. It was a two part journey, since his ship didn’t have the necessary shielding to fly into and land on the sun. So, we switched to a properly shielded ferry on Mercury X, the scorched planet most closely orbiting Hegula. All the windows were specially polarized; a mere fraction of the ambient light made it through them to my eyes, yet it was enough to bathe me in a brighter light than I’d seen in years. The depths of space I fly through are known for being dark. I hadn’t realized what I was missing. I felt positively giddy from the sunlight as I stepped out of the ferry and onto… well… the surface of the sun. At least, it felt like standing on the surface of the sun. Blanchley explained the technology on the ride over. I’ll see what I can remember, but the real people to ask are those Wespirtech wizards. I’m constantly amazed by what they produce. The idea behind the sun gardens is to bring heliotropes (which are most plants) as close as possible to what they love: sunlight. Since stars have no solid surface, the Wespirtech scientists behind all this had to invent one. Thus, they constructed a huge bubble from massive and exceptionally expensive solar force shields and radiation osmitters. The bubble floats on the sun’s photosphere… or maybe it orbits just above the photosphere… I don’t recall. From space, this moon-sized bubble is so dwarfed, it looks like a bead of sweat on the hot face of the sun. The effect, on the inside, is amazing. Orangey light glared all around me. The very ground beneath me transmitted it, since the soil is a nutrient-rich, fiber-optic sand. The translucency let me imagine I was walking on water… or magma, because of the glow. With the night sky, overhead, peeping between the tangle of trees, it was enough to take my breath away. When I imagine Eden, since that day, I imagine that: a living ball of plants, branches, vines, and brush, infused with a solar glow. “Ready to move in yet?” Blanchley asked, seeing I was awestruck. “Sure. If I can have a house here. Your asteroid belt is a lot less appealing.” I pulled my shoes off and felt the damp, glassy sand under my feet. I laughed. Okay, honestly, I giggled. I was using my toes to draw in the sand, and I don’t even remember what was funny, but I thought it was hilarious. Blanchley told me I was a prime candidate for Inverse Seasonal Affective Disorder. I thought that was funny too, but I took the clue and sobered up. I didn’t want to find my tour cut short by a doctor visit, and Blanchley wasn’t showing much of a sense of humor. A head gardener joined us and walked us away from the garden’s edge and the hatch in the outer wall of the bubble, where the ferry docked. He talked of the plants we passed, almost all gengineered to take full advantage of their special home on the sun. Their leaves grow upside down — the majority of the chlorophyll on the bottom. It makes them look more vivid, greener than most plants. “They want it all,” Blanchley said. The gardener looked grim and Blanchley looked uncomfortable. If I’d questioned them further at the time… But it’s no use going down that road. What’s done is done. For the rest of the tour, we stayed away from politics, and I didn’t learn about the Expansionist militia’s imminent arrival until a week later when Blanchley’s conscience finally got to him. He sought me out in the starwhal’s playpen. We were training, working up new tricks for the show. Blanchley watched and flattered us, chitchatting for some time before he told me. The Expansionists had decided to make an example of Hegula Hephaesta. If the first sun garden wrangled a deal, it would set a precedent. All the sun gardens would insist on keeping a percentage share. I wondered if Hegula Hephaesta had the firepower to stand up to the government. I wondered if the government would really have the nerve to attack them. I didn’t wonder if the fleet would let me go, and it turns out that’s what I should have worried about. “I’m not from this system!” I argued ineffectually against radio silence. My starwhals and I had no alternative but to return to the asteroid belt, where we’d been living. The starwhals were clearly shaken up by the warning shot, so I calmed them with a meal of mutated microbial dust that I save as a special treat. I waited on my ship, watching through the windows. I imagined I could see dim flashes in the distance. Explosions? Weapon fire? Poor eyesight? Angered by my mistreatment and dazzled, still, by the Shangri-La I’d visited, I rooted for the Hegulans. Sure, I wished Blanchley had given me more warning… enough to get away… But the Expansionist fleet’s behavior was beyond reckoning. After a day of waiting and stewing, I risked the flight into the hub of Hephaesta colony. What I saw shook me to the very core: damaged, burning buildings; punctured atmospheric domes; scorched earth and shattered rock. True, most of the asteroids were intact. Much remained undamaged. But, this was a small comfort, like a battered woman explaining that her abusive lover never broke her bones. Even one bruise is too many. We stood in silence. What could either of us say? To believe we lived under a government that power crazy… It should have been unthinkable, but there was evidence, right in front of us. “How is the colony faring?” I asked. The question, floating between us, was: when does the fleet plan to stop? Neither of us dared ask, and neither of us had an answer. “I wish there was something I could do,” I said. The warning shot from the fleet came back to me. It had scared them, but they weren’t dangerous. My face burned with anger and shame. I couldn’t promise him that. How could I? But… what he was asking… what I knew he was asking… it was too much. Too, too much. “I love my starwhals.” He didn’t have to tell me that a lot of people had lost people they loved. I knew it without him telling me. That night, I lay on my bunk, in my ship. I tuned the ship radio to pick up the starwhals’ song. It blasted over the speakers, and I sank into it. Those haunting voices, not meant for human ears, were so familiar to me. I imagined I could tell them apart: Hermes’ voice high and playful; Jojee’s a deep, reprimanding baritone; and Trina, good Trina, always reconciling the two. When their dinnertime came, I fell asleep crying. I’d feed them in the morning, I told myself. What Blanchley asked was wrong, but I couldn’t get the picture he’d painted out of my head. My gentle giants, innocent nebula dwellers, on a horrible, deathly rampage. The truth was: I didn’t know another way to kill them, and I couldn’t take the risk. Every mealtime, I reminded myself of the children who’d come to the shows. I imagined those same children, screaming in horror as the massy bulk of Jojee thrashed against Hephaestan buildings. Or, Trina’s spear-like horn punctured the last, structurally sound, atmospheric dome. I hated seeing them as monsters, and it all melted away when they’d perform their tricks, hoping for treats. They begged for food in the only way they knew how, in the way I’d taught them. Hermes arranged minor asteroids into loops, and jetted agilely through the self-made obstacle course. Trina and Jojee spiraled around each other, and passed asteroids back and forth on their jet streams like racquet balls. I could see the tricks getting harder for them, as they grew weaker. Trina was stronger than the others, and tried to help them. She nudged her body against Hermes, rousing him, urging him to go on. She did her routines with Jojee, covering Jojee’s weariness and hunger born mistakes. Good Trina. Each day, the three moved a little less, sang a little less, looked one step closer to death. Maybe, if only, the fleet had left me alone for one damnable day, I would have given in and fed them. Instead, I found myself chasing away tanker ships, hoping I could keep them away until the starwhals died. I hoped for them to die! Just die fast enough, I said to myself. Die before I can’t chase the ships away, and they set you free. God, how I hate myself. Blanchley came to me, in my mourning. He came onto my ship and told me the war was over. I could leave. I forced a smile, but I don’t think it came out as one. Blanchley didn’t ask about the starwhals, and I didn’t tell him. He could see the lifeless bodies as well as I. He left, pressing me to stay or visit again. That’s likely. If they’d held on a few more days, we would have left together, my starwhals and I. We’d have taken our show back on the road, and I’d have never looked back at that hate-able system. Maybe, I would have returned them to the Kleidadoan nebula instead. Yes, I would take them home. I’d never see them again, but I’d know they were alive. And well. Cavorting in their native plane. Instead, I towed my starwhals to the sun that had been their undoing. I watched them fall, under the slow force of gravity, toward the ball of churning fire. I’d done the right thing. I tell myself, still, that I did the right thing. It would have been selfish to risk the lives of children. The lives I mourn may have been the least of those lost for the Hegulan cause, but they were mine to look after. Jojee, Trina, and Hermes chose to follow me out of their nebula, and I didn’t ask for that responsibility. But I accepted it. They had no share in the events leading up to their demise; and, I take no share in the bitter-sweetness of the Hegulan victory. I cannot help but feel, I served my starwhals poorly. The fire swallowed their dark bodies; I wish it had swallowed my pain. Previous Previous post: Day two!